Make Easy Deviled Eggs for your party or potluck! 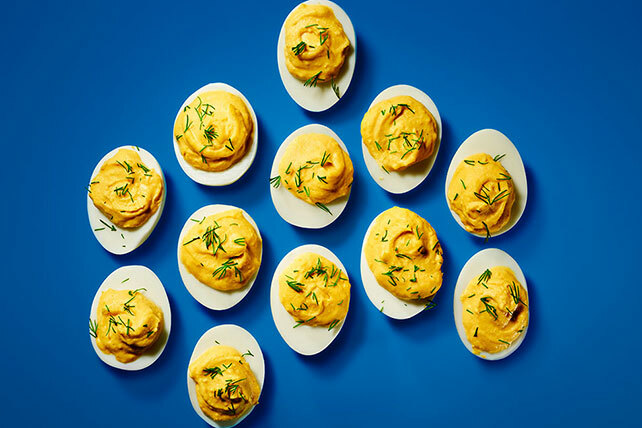 Dijon mustard puts the devil in these Easy Deviled Eggs, and they're softened with MIRACLE WHIP Dressing. Cut eggs lengthwise in half. Remove yolks; place in small bowl. Add dressing and mustard; mix well. Spoon into egg white halves; sprinkle with paprika. Garnish with fresh dill sprigs before serving. Spoon yolk mixture into resealable plastic bag. Cut off one bottom corner of bag; use to pipe filling into egg white halves. Add one of the following ingredients to yolk mixture before spooning into egg whites: 2 Tbsp. TACO BELL® Thick & Chunky Salsa; 2 Tbsp. OSCAR MAYER Real Bacon Bits; or 1/2 tsp. chopped fresh herbs, such as basil, parsley or thyme.